Display your own web site in the embedded browser and configure the barcode scanner to send it the scanned codes. 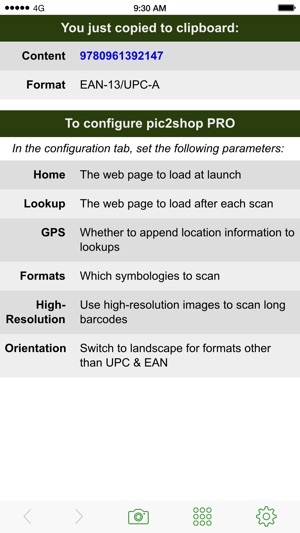 Or use pic2shop PRO as an external scanner from another app. Or copy the barcode to the clipboard for use anywhere. EAN and UPC barcodes can be read even on devices without autofocus. 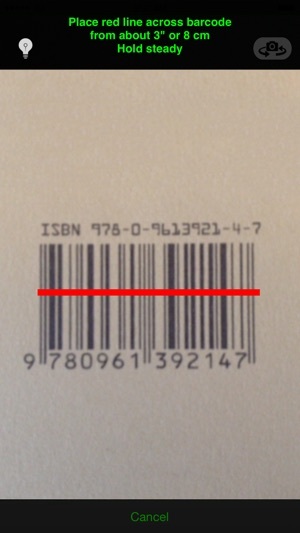 To be scanned correctly, the other barcode formats need to be large enough to make all the bars or dots visible. THIS IS NOT A SHOPPING APP. WE DO NOT PROVIDE THE HOSTING SERVICE NOR THE WEB APPLICATION. 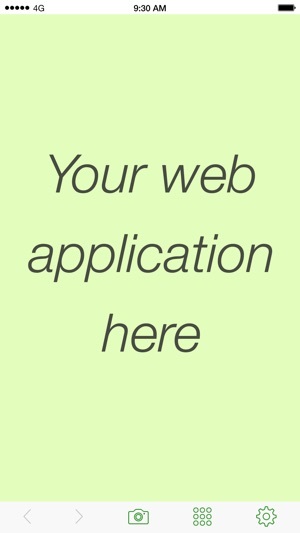 YOUR ARE RESPONSIBLE FOR DEVELOPING THE WEB APPLICATION AND HOSTING IT ON YOUR OWN SERVER. 1. Home Page URL: the url of the web page displayed when the app launches (optional). 2. 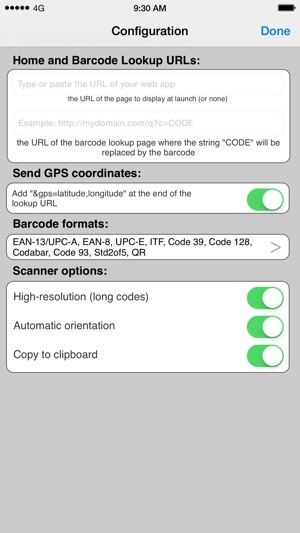 Barcode Lookup URL: the url fetched when a barcode is scanned. The string CODE is replaced by the barcode content, and the string FORMAT is replaced by the symbology of the decoded barcode. That is how the barcode information is transmitted to your web app, and how the response is displayed to the user. 3. Send GPS coordinates: add a "&gps=latitude,longitude" to the lookup URL. 4. Formats: select which formats the scanner needs to look for. We recommend turning off the formats that are not needed for speed. Please note that you can include as many other parameters as you like in either URL, they will be passed as is to your server. For example, you could give to each user a URL with a different "&userid=NNN" parameter to automatically identify them with the web application. In addition, one can switch off the in-app configuration in the general iOS settings list to help lock down the config. Pic2shop PRO, can be launched by another app or by a web page to scan a barcode, then pass the result back to the calling app or web page. 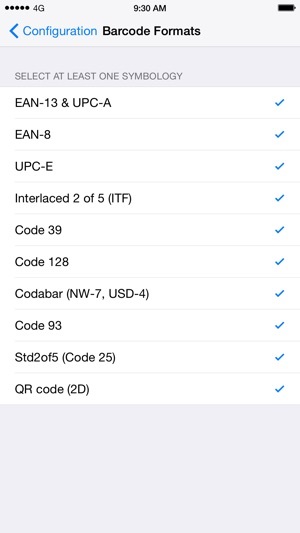 A popular use is to import barcodes into the Filemaker Go application. The callback URL should be percent-encoded and contain the strings CODE and FORMAT, which will be replaced by the barcode content (or 'CANCELLED') and symbology, respectively. For security reasons, HTTPS will not work with self-signed certificates. Thank you for using pic2shop PRO! If you find it useful, please spread the word! Over the years I've used this app for two different projects. 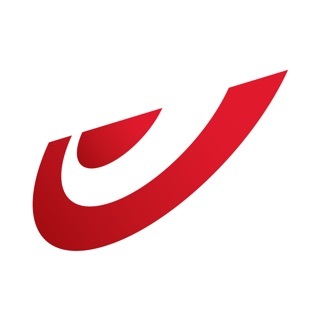 Clients love that I can bang out mobile scanning web apps without the time and cost of cross-platform native mobile app development. Pic2Shop pro makes me look like a hero. The GPS tagging is great. I use it to validate delivery scans against addresses to minimize mistakes. Only thing is I can't figure out how to enable GPS from custom URLs, but using the built-in scan button in app works fine.